Childhood Emotional Neglect (CEN) happens when your parents fail to respond enough to your emotional needs as they raise you. 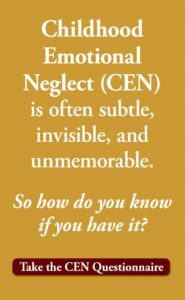 You can see from this definition that Childhood Emotional Neglect is not something that your parent does to you. Instead, it is something that your parents fail to do for you. For example, your parents fail to notice enough when you are upset, hurt, or in need of help. Or they fail to ask you enough what you feel, what you need or what you want. So it’s not an actual event, it is quite the opposite. It is, in fact, an event that fails to happen. This is why I have so often said that most Childhood Emotional Neglect is typically invisible and unmemorable. It weaves itself into the fabric of the family, and endures quietly in the everyday drumbeat of family life, with emotions in the family falling under the radar day after day after day after day. No one talks about feelings or names them, no one teaches the children about feelings, and no one validates what anyone else is feeling enough. Which is not to say that none of it ever happens at all; but simply that it does not happen as much as the child needs. But there was a 2009 experiment by Dr. Edward Tronick, a psychology professor at UMASS Boston, that shows a sudden, active, visible, and memorable version of Childhood Emotional Neglect as it happens. After you watch the video, I have more to say. But please do not read further until you’ve watched the video. So go to the link below and watch it. Then come right back here so that I can help you process it. Even if you have seen this video before, it is vital that you watch it now. We need it to be fresh in your mind as we use it to process your CEN. Watch the Still Faced Parent Video. Then come right back! OK, so now you’ve watched the video. And I have some questions for you. I would like for you to take some time with each question, really thinking about it. Writing your answers is helpful instead of just thinking them. What feelings did you see the baby having after its mother assumed the still face? Can you name three? Please make sure you use only one word for each feeling, not phrases or descriptions. Did you have any feelings while you watched the video? Can you name the feelings you had while watching it? Again, single words, not phrases or descriptions. I ask you to consider how the child responded in the video, what you thought the child was feeling, and how intense her feelings were. Then think about how it might affect an infant to grow up with a parent who is not necessarily as dramatically ON or OFF as the Still Faced Parent but is nevertheless blind to her child’s feelings. 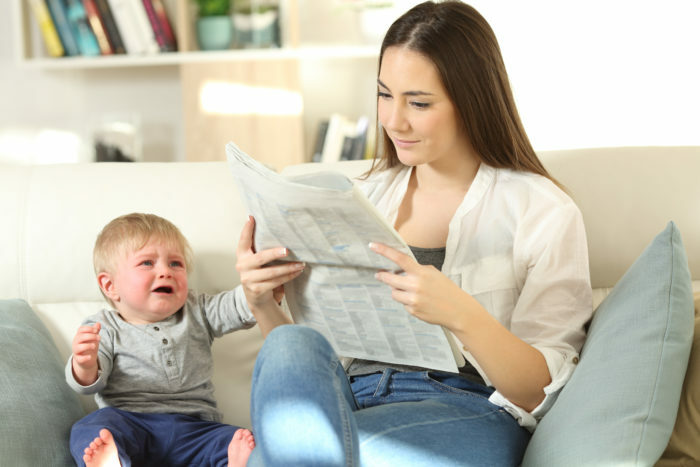 Unlike the extremes of the still faced parent, the emotionally neglectful parent’s emotional inattention may be quite consistent and predictable. Imagine that the child continually goes to his parent for soothing or support, and can generally count on having his physical needs met. But his emotional needs fall by the wayside. What does this child learn? She learns that when she needs to be soothed, comforted, or understood, she should keep those needs to herself. She learns that, unlike her physical needs for food, water, clothing, and shelter are important, but that her emotional needs are not. She learns that the deepest, most biological expression of who she is, her emotions, do not matter. She learns that she does not matter. Yet the emotionally neglected child will likely have no memory of his parent’s failure to act. Unlike the child of a more extreme or unpredictable parent who suddenly withdraws attention, rejects or abandons the child, or emotionally abuses him, he will likely be unable to see or recall the more subtle, everyday lack of action. This is what happens in the life of the child who is growing up with Childhood Emotional Neglect. In my five-part Fuel Up For Life Recovery Program to heal Childhood Emotional Neglect, the first step is the foundation for the other four. Step one is becoming aware, and truly accepting, the reality of your Childhood Emotional Neglect: that it happened to you, how it affected you as a child, and how it’s affecting you now. Now that you have watched the video and thought about how it pertains to you, I invite you to go back and watch it again. This time, pay attention to what you are feeling as you watch it. Watch the Still Faced Parent Video Again. Then, keep in mind this: the feelings you have while you watch this video are likely the ones you had as a child, probably in a less intense but more chronic way, over and over throughout your childhood. These are probably also the feelings that reside in your body, now walled off but still there, in your adult life too. Over the next few weeks, when you have a few minutes to yourself, keep picturing yourself in the place of the child in the Still Faced Parent Video. Try picturing yourself as a child, with the parents you had and in the home you grew up in. What CEN lessons did you learn? What CEN messages did you get? How are you continuing to follow those lessons and messages now? Consider these questions for some time, and think deeply into it. Your answers form the foundation upon which your healing will be built. The deeper your understanding, the more thorough your awareness, the more ready you will be for the next step in your recovery. Childhood Emotional Neglect can be subtle and unmemorable. To find out if you grew up with it, Take The Emotional Neglect Questionnaire. It’s free. 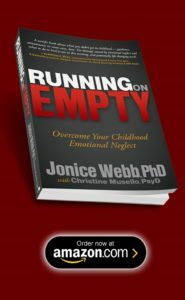 To learn much more about Childhood Emotional Neglect, see the book Running On Empty: Overcome Your Childhood Emotional Neglect. 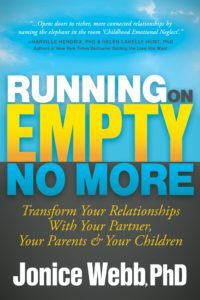 To learn how to feel your feelings and express them in your relationships plus parent your children in an emotionally responsive way, see the book Running On Empty No More: Transform Your Relationships. I remember my mum telling me she was leaving me and she would run out of the living room and I would hear the front door banging. Every time it happened, I was hysterical to say the least. Jonice, thank you for everything, your books, your emails, your hard work. When I discovered you a few years ago, it was like discovering gold. I am healing a little bit more each day. Dear Al, that is a painful memory of CEN in action. I am so glad to be a part of your healing. Watching the video made me feel very scared, hopeless and anguished. I remembered feeling that the only feeling that I could produce in my parents was indiference, rejection for being so a burden. Until a very few years I learned that chuldren could be a source of happiness, not only a burden to carry and stop living and enjoying ourselves. So, of course, I don´t have children and it is very difficult for me to think someone thinks I am lovable and worthy of affection. I am criying to remember those feelings that I grew up with. Thanks to help me discover that the problem wasn´t me. Dear Mireya, no the problem certainly was not you! Your parents were not able to see you or love you. It was their limitation, not yours. I hope you will take this knowledge, own it, and move forward to heal. You deserve better! When I read your comment, I just had to reply to you. As I read it, all I could think is, “I could’ve written this.” The only difference is that I did have children. However, my 2 siblings did not, and I always felt deep inside that it was indicative of something wrong in our family. I’ve just started discovering CEN, and understanding that I could be the poster child. Your comments touched me deeply. Good luck to you in your recovery. Thanks Jonice, that video speaks volumes. I just wanted it to end! I remember doing anything to get my mother’s attention, to get her acceptance and approval and, ultimately, her love. I thank you for your ongoing work in helping so many of us in the recovery and healing process. Dear Sue, it is sad indeed when parents are not able to give their children that one-on-one feeling of emotional connection. I’m sorry that happened to you. Keep on going in your healing. Thankyou so much for your work Jonice, and making it available to everyone. I’ve read both your books and everything just fell into place, all the issues I’ve struggled with over the years. I’m looking forward to slowly undoing the damage of CEN and being able to live a much happier and more fulfilling life. Thank you! Dear Kay, I’m so glad. Take care! Thank you for your understanding and efforts to learn and share about this phenomenon. Thanks for your support of my work Ethan. I’m so glad you find it helpful! Your work has truly been a life changer for me! It’s incredible the difference it has made in my happiness, outlook, & ever increasing ability to be vulnerable. I am so happy to hear that RL. Keep up the good work! Many thanks again for the think-through email which I am most of way through. Sure I’ll see positive results. Of course I will recommend your work! I’m glad Rachel. Thanks for your comment!